When I spotted this blouse in H&M for a mere £7.99 I knew it had to be mine! A total bargain for such a detailed and pretty piece. Another hit from H&M, following their sell out off shoulder top in the Summer; I've seen this blouse all over instagram, and worn by several fellow frill-lovers in my office too! The formal, frilly shirt works really well contrasted with a casual pair of jeans and simple slip-on loafers, for a polished yet dressed down vibe. 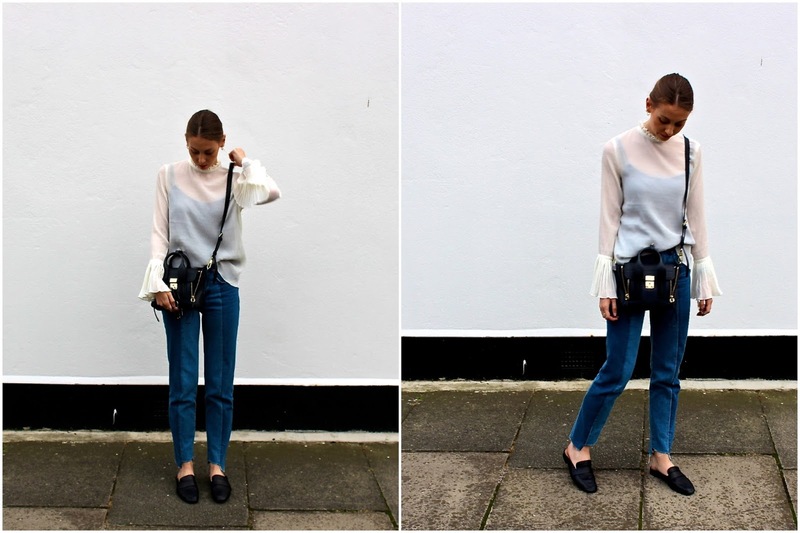 I've paired the blouse with these two-toned, panelled jeans, also from H&M! I love the step-hem detailing on these; they definitely look more expensive than their high street price tag. Finishing off with this cross-body satchel from 3.1 Phillip Lim, again adding a bit of everyday polish to the look. I love a cross-body bag as they not only look cute but are extra-functional, as you can wander around hands free and have all your valuables in sight!